The much-hyped Lightning Network is “impractical” and “suffers from routing errors and wallet bugs,” according to the findings of a study done on the network. Andreas Brekken of Shitcoin.com has been testing the Lightning Network after becoming the single largest node, to see whether the use case for the technology stacks up in practice. After finding the rewards for running a node pitiful in the last installment of his report on the Lightning Network, it’s more bad news for proponents of the technology. Brekken put the Lightning Network to the test, attempting to send payments for good and services. 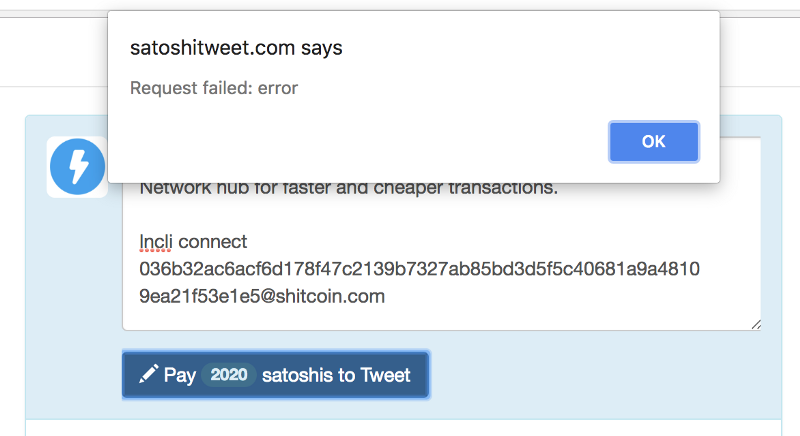 He chose SatoshiTweet, a service that charges users to send a tweet from their official account, which only accepts Lightning Network payments. But upon trying to send the payment, Brekken encountered a series of glitches and errors. He then tried over at Lightning Spin, a dice gambling game using Lightning Network. But again, Brekken encountered a series of errors. This pattern was repeated at several further sites, including Bitrefill, Satoshi’s Place and The Blockstream Store, as well as Lightning Network wallets. In each and every case, Brekken ran into problems with the technology. After concluding the transaction phase of his review, Brekken came to the conclusion that the Lightning Network in its present form is still unusable, even for users with a good understanding of the technology. “Sending payments using the Lightning Network is cheaper than the regular [SegWit] network, but suffers from routing errors and wallet bugs that make it impractical even for highly technical users,” he wrote. Read his previous review on running a Lightning Network payment hub here.